Mega Man fans might not be getting the games they want, but toys? They're good on toys. Just look at this gorgeous thing. 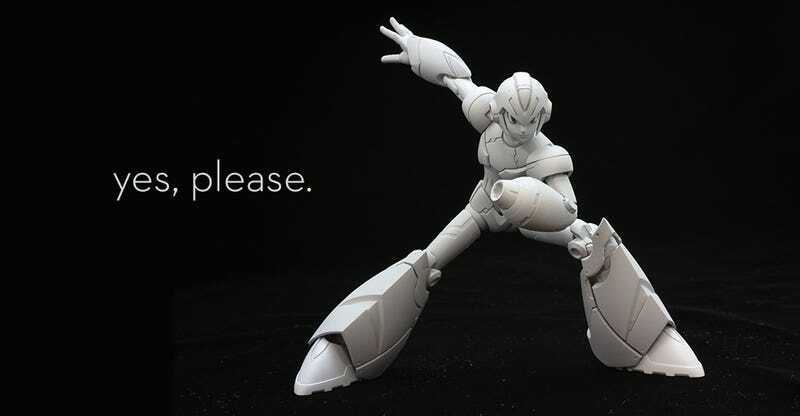 Revealed exclusively over at The Mega Man Network on Thursday, TruForce Collectibles' upcoming Mega Man X figure doesn't need any paint to be beautiful. Look at those gorgeous lines. The shoulder pads, the chest plate — those incredible boots with sculpted tread. 20 points of articulation. Die-cast armor on the chest, shins and feet. It's also got swappable hands, an extra shouting face, and LED functionality for the X-Blaster, complete with some sort of firing effect attachment. I've been staring at these pictures for two days, attempting to will the figure into existence on my desk. So far all I've gotten is empty energy drink cans and Pop Tart wrappers, but I'm close. So the question is, where do I mail my money? That's still up in the air. TruForce Collectibles is a brand new company, and while they've got the license to create the toy, they're still working out how to pay for production. According to The Mega Man Network (where more pictures of the piece dwell), there's been talk of turning to Kickstarter to pay for production. I say go for it — toy Kickstarters are the best.